Bruno came to ACC with an injured leg—he’d been hit by a car twice—and through funding by Friends of SFACC, received surgery to repair it. However, the post-operative rehab he needed could not be provided by ACC resources. So Pet Camp, a San Francisco pet daycare and staycare facility, rehabilitated (physically and socially) Bruno over a period of seven weeks staff embraced the challenge of giving him physical therapy (three times a day and a swim in a special therapy pool every other day) and lots of love. Shy, gentle Bruno came out of his shell and became a social butterfly who enjoys playtimes with other dogs, is compatible with cats, and has been given a 100% clean bill of health by the vet. Bruno became a Pet Camp favorite camper over his seven-week stay. 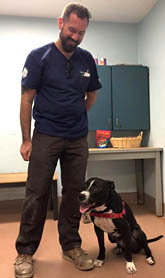 The Pet Camp staff not only loved and rehabilitated Bruno, they blogged about him on the Pet Camp website, showing his weekly progress and sharing his story through social media—creating adoption interest through this effort. He will be missed by his entourage at Pet Camp but they’re happy to have helped him on his way to his forever home. 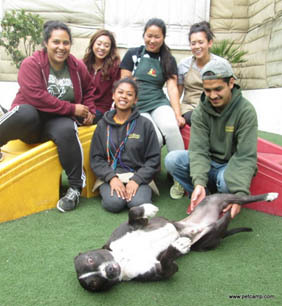 The partnership between ACC and Pet Camp was made possible by a service-trade sponsorship through Friends of SFACC. Friends of SFACC offers sponsorship benefits each year at Pet Pride Day, usually in exchange for monetary payment but in this case, Pet Camp gave ACC their services, a very practical way to donate. 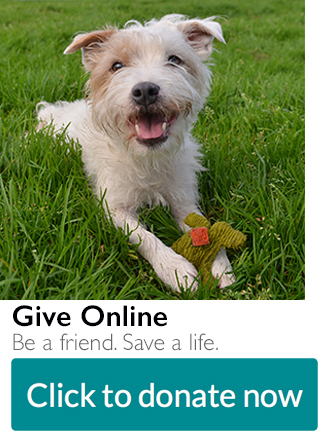 Thank you Pet Camp for going above and beyond to help Bruno become the happy, healthy dog he is today.